Opuntia ficus-indica is a species of cactus that has long been a domesticated crop plant important in agricultural economies throughout arid and semiarid parts of the world. It is thought to possibly be native to Mexico. Some of the common English names for the plant and its fruit are Indian Fig Opuntia, Barbary Fig, Cactus Pear, Spineless Cactus, and Prickly Pear, although this last name has also been applied to other less common Opuntia species. In Mexican Spanish the plant is called Nopal, while the fruit is called Tuna, which are names also used in American English, especially as culinary terms. Indian Fig Opuntia is grown primarily as a fruit crop, but also for the vegetable nopales and other uses. Most culinary references to the “Prickly Pear” are referring to this species. The name “Tuna” is also used for the fruit of this cactus, and for Opuntia in general; according to Alexander von Humboldt, it was a word of Hispaniola native origin taken into the Spanish language around 1500 CE. Cacti are good crops for dry areas because they efficiently convert water into biomass. Opuntia ficus-indica, as the most widespread of the long-domesticated caci, is as economically important as corn and Tequila Agave in Mexico today. Because Opuntia species hybridize easily (much like oaks), the wild origin of Opuntia ficus-indica is likely to have been in Mexico due to the fact that its close genetic relatives are found in central Mexico. The most commercially valuable use for Opuntia ficus-indica today is for the large, sweet fruits, called Tunas. Areas with significant tuna-growing cultivation include Mexico, Malta, Spain, Sicily and the coasts of Southern Italy, Greece, Libya, Tunisia, Morocco, Algeria, Lebanon, Syria, Egypt, Saudi Arabia, Yemen, Israel, Chile, Brazil, Turkey, as well as in Eritrea and Ethiopia where the fruit is called Beles. In Sicily, where the Prickly Pear fruit is known as Ficudinnia (the Italian name being Fico d’India, meaning “Indian Fig”), the cactus grows wild and cultivated to heights of 12–16 feet (4–5 m). In Namibia, Opuntia ficus-indica is a common drought-resistant fodder plant. The plants flower in three distinct colors: white, yellow, and red. The flowers first appear in early May through the early summer in the Northern Hemisphere, and the fruit ripen from August through October. The fruit are typically eaten, minus the thick outer skin, after chilling in a refrigerator for a few hours. They have a taste similar to a juicy, extra sweet watermelon. The bright red/purple or white/yellowish flesh contains many tiny hard seeds that are usually swallowed, but should be avoided by those who have problems digesting seeds. In the center of Sicily, in the Province of Enna, in a small village named Gagliano Castelferrato, a Prickly Pear-flavored liqueur is produced called “Ficodi”, flavored somewhat like a medicinal/aperitif. In the early 1900s in the United States, the Prickly Pear fruit was imported from Mexico and Mediterranean countries to satisfy the growing population of immigrants arriving from Italy and Greece. The fruit lost its popularity during the mid-1950s, but has increased in popularity since the late 1990s, due to the influx of Mexican immigrants. Recently, the cattle industry of the Southwest United States has begun to cultivate Opuntia ficus-indica as a fresh source of feed for cattle. The cactus is grown both as a feed source and a boundary fence. Cattle avoid the sharp spines of the cactus and do not stray from an area enclosed by it. Native Prickly Pear growth has been used for over a century to feed them; the spines can be burned off to reduce mouth injury. The cactus pads, on which the cattle feed, are low in dry matter and crude protein, but are useful as a supplement in drought conditions. In addition to the food value, the moisture content virtually eliminates watering the cattle and the human effort in achieving that chore. Mexican and other southwestern residents eat the young cactus pads (nopales, plural, nopal, singular), usually picked before the spines harden. They are sliced into strips, skinned or unskinned, and fried with eggs and jalapeños, served as a breakfast treat. They have a texture and flavor like string beans. They can be boiled, used raw blended with fruit juice, cooked on a frying pan (tastes better than boiled), and they’re often used as a side dish to go with chicken or added to tacos along with chopped onion and cilantro. 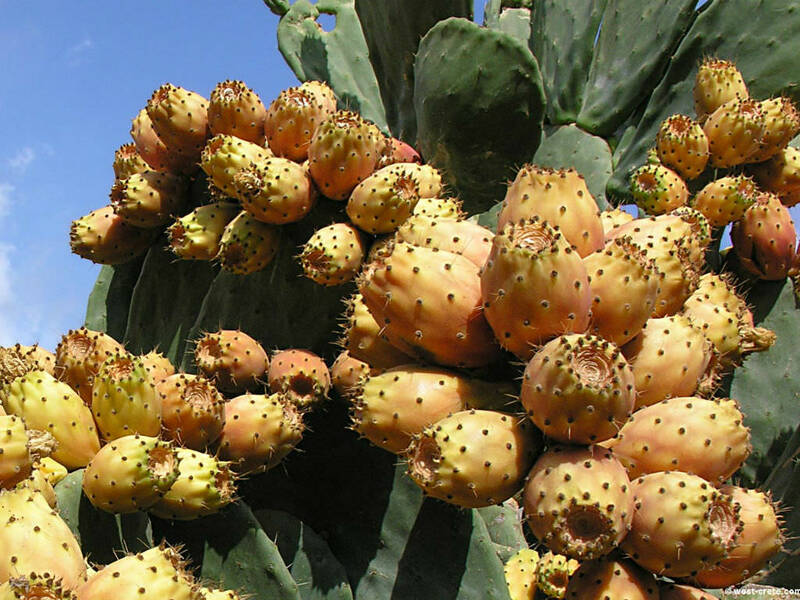 In Malta, a liqueur called Bajtra (the Maltese name for Prickly Pear) is made from this fruit, which can be found growing wild in most every field. On the island of Saint Helena, the Prickly Pear also gives its name to locally distilled liqueur, Tungi Spirit. Other uses include as an ingredient in adobe (to bind and waterproof). Opuntia ficus-indica (as well as other species in Opuntia) is cultivated in nopalries to serve as a host plant for cochineal insects, which produce desirable red and purple dyes. This practice dates from pre-Columbian times. The fruit of Opuntia ficus-indica can cause constipation if consumed with the seeds, without the seeds it is laxative. A University of South Florida engineering professor and a team of researchers have found that mucilage from the Prickly Pear cactus works as a natural, nontoxic dispersant for oil spills. The fruit contains vitamin C and was one of the early cures for scurvy. The red colour of the juice is due to betalains (betanin and indicaxanthin), two molecules with antioxidant activity. The plant also contains the antioxidant flavonoids quercetin, (+)-dihydroquercetin (taxifolin), quercetin 3-methyl ether (isorhamnetin) and kaempferol. Other constituents of the pulp of the fruit are carbohydrates (glucose and fructose, starch), proteins and fibers rich in pectin.